The Montblanc M series of pens. Are there reasons so compelling we’d happily open our wallet and forgo several hundred dollars for the privilege of owning one? Perhaps some of us may waver a little in answering that question, others definite one way or the other. Now substitute another make, model and type of pen in the AUD$500 plus price bracket and ask the same question. Heck, substitute another product instead – leather goods, watch, anything you care to think of. Same answer? Maybe, maybe not. I recently bought one and I love the damn thing. I guess the kicker being I bought the ballpoint. An obscene amount of money to spend when you won’t even find a nib on the end? Sure is, though if that’s the language we’re using, I’d suggest it’s probably no less obscene regardless of what hits the page at the end of the barrel. Once in the world of pens, we’re really into respecting choices rather than providing judgement aren’t we? Now is the time to nod if that isn’t what you’re seeing in the reflection of your screen at the moment. Outlining the rationale of such a purchase to a longstanding office cupboard company-supplied plastic throwaway user? Perhaps a little more challenging. That same challenge probably becomes insurmountable when having the words “oh I just really like using fountain pens” not available to you in said conversation. I guess that’s why we write about them instead. Looking around, there are many interests, passions, or even vices to indulge us and lighten our wallets a little – or a lot. The online community then provides most of the conversation. So while I do not seek approval for adding a ballpoint pen to the stable, I find it interesting to think about how I ended up here, and what better way than to put you kind people through a blog post. In the latter part of last year my pen buying plans were non-existent, as they often are at any given time. Being lucky enough to own some outstanding fountain pens, contentment remains the first word that comes to mind when I think about them or what to use next. I have no pending “grail pen” as many do (which more often than not seem to be of the fountain variety, and fair enough), many recent acquisitions have been rollerballs (with the exception of a kindly gifted Lamy aion fountain pen), and as I’ve alluded to, my pen thoughts usually run to next use rather than next buy. Having said that, there remained a gap to be filled. Not in my collection per se – more so a tool for a specific job. So I regret to advise the remaining applicants, for now at least – the role has been filled. Working in Brisbane’s CBD, I am lucky enough to have two pen stores, the Montblanc boutique, and Dymocks, all within a couple of blocks from the office. Add to that some outstanding specialty coffee establishments, and the hobbies/interests/passions category of my existence is well and truly catered for within the radius of a 5 minute walk. I happened to find myself perusing the wall of leather goods in the Montblanc boutique (you know…as you do on any given day), and upon turning to leave, those astute Montblanc marketing people had placed the M Ultra Black series display firmly in my eye-line. Now, in the original (and high gloss) precious resin upon its initial release, the M design definitely appealed to me, however I have a bit of a thing for matte black and/or brushed type finishes. If you then add accents of silver rather than a gold, I’ll find it extremely hard to resist simply walking past your display. Seed firmly planted, or if I am entirely honest – it had sprouted. Do I really need a why? Here, it would be easy to say no (particularly if I refer to some of my comments above), though in reality, spending not insignificant money on something as self-indulgent as an expensive pen (or alternatively say, an espresso machine) requires at least a few ink smudges in the yes column. 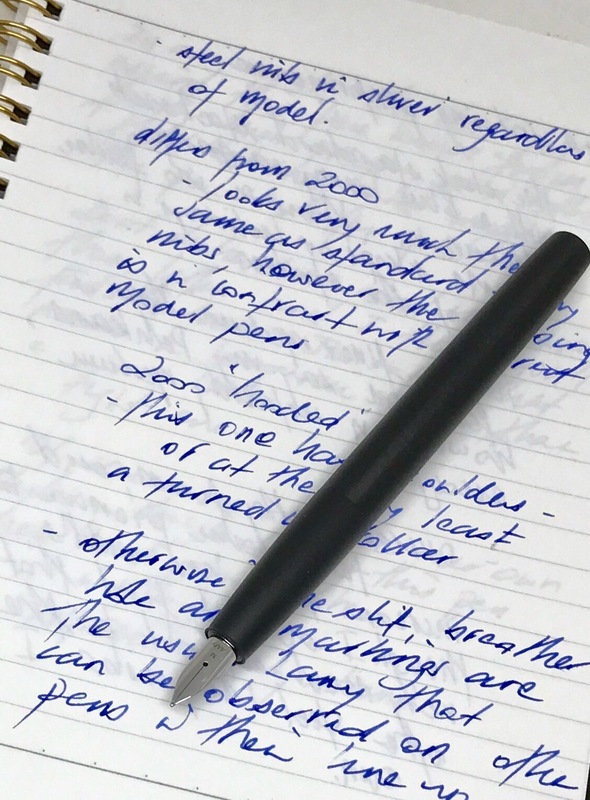 When I bought my first fountain pen (the Montblanc Meisterstück Classique I’ve written about before), I’d always planned to buy a ballpoint “in a few years time” to use as an everyday work writer. Well, a few years turned into twenty, and for the money, it was never going to be a priority any sooner than that. I guess nothing in the category had ever really caught my eye either. Any list of this is why it isn’t a fountain pen I provide here can easily be refuted, however know that I’ve already considered any options and already done just that myself. In any event, I’m not here for the hard sell – you will no doubt have very good reasons for making your own choices, even if they are a 180 degrees from mine. Put simply, a half-dozen signatures on a document sent around a meeting room table; a number or note scrawled on a Post-It; annotating a folded document or taking meeting notes with a book perched on my knee; a brief comment on a 20 page document quickly closed. The list of course is not exhaustive, and as I mentioned – yes, all of those and more could easily be the domain of a fountain pen. Personally, for the sake of smudge-free, simple and efficient, I’m simply more comfortable in my office environment for it not to be. So did I necessarily set out to hunt down and buy a high-end ballpoint (if that in itself is not a contradiction in terms)? No I didn’t, however with my fondness for the M design (with that Ultra Black finish! ), those specific (non-fountain pen) requirements, and a sale to boot – the Montblanc stars (well snow-covered peaks at least) were aligned to make this a compelling purchase. Now as much as I enjoy wandering around the Montblanc boutique, my next port of call a few days later was to discuss my options with Mal and Melissa at Pen and Paper – my absolute favourite establishment in the CBD. For the warmest embrace into the stationery and pen family, a visit is a must if you are ever in Brisbane. I’m not going into details here (this post is long enough), but let’s just say my decision tree wasn’t functioning in all its efficiency the day I went to actually buy the pen. Or maybe it was, and simply took every ounce of my willpower to stay on track for what I needed. Without the understanding of the two fine people I’ve mentioned above, I would have left the store, not looked back, and never returned. I’m almost not joking either. And so on, and on… and on. As someone who likes to think they are at least a little knowledgeable (though I’ve now learned perhaps not always rational) about pens, it was an absolute shambles I tell you. “That’s because you weren’t buying a fountain pen – it was a sign!” I hear you screaming. In many instances, I’d agree with you – but that wasn’t it, and I keep coming back to (as I held myself to on that day also) the right tool for a specific job. I do thank Mal and Melissa from the bottom of my heart. It wasn’t a transaction that day – it was emotional support. Speaking of support – that’s Pen and Paper in Brisbane’s CBD (or online at the link above) – you know what to do. So what about the pen? I’ll get to that more specifically in an upcoming post. I’ve kept you long enough this time. For now, I’ll just be content with ticking off quite a few boxes associated with filling that specific need, acquiring something I’d planned many, many years ago, and having something on my desk at the office with a design I very much enjoy taking the occasional moment to pause and stare at. Just to be clear though – I love it. Yes, for all the reasons I’ve mentioned, however as a hardworking writer both in and outside the office – it is an outstanding pen. Sure, there was an emotional draw and I love the design, and if design didn’t matter we’d all simply be using nondescript nib holders instead of fountain pens. To sum up this whole surprise, joy, turmoil, and utter contentment experience, I’m very pleased I managed to be objective enough about what I needed, to come away with what is now in use every day at work. If, after reading all of this, you looked at me and said “Pete… really? It’s a pen mate? !” I wouldn’t disagree with you – yet at the same time that’s precisely the point isn’t it. 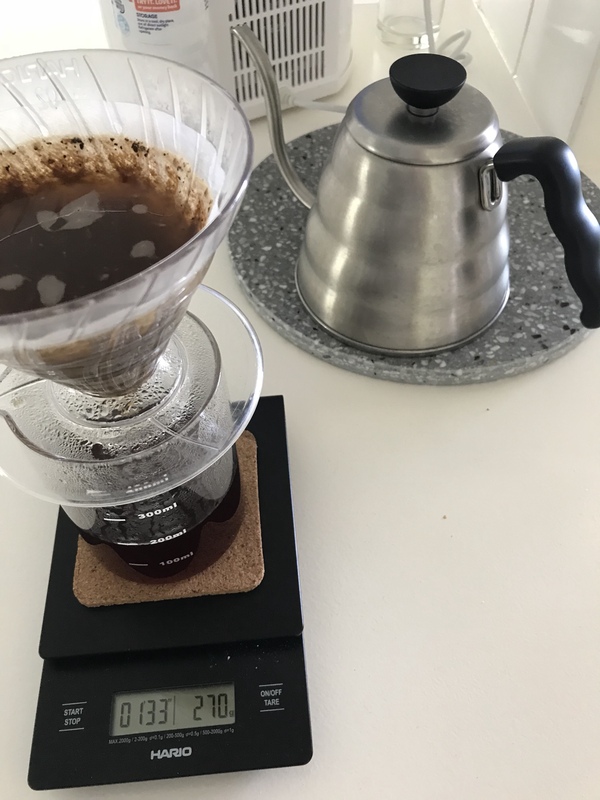 In a haphazard though never-ending quest for consistently better coffee quality at home, recently I have found myself tinkering with some brewing water recipes. Why think about the water you brew with? Whether espresso or filter brewing, if you think about what is actually occurring – water breaking down ground coffee particles, thereby extracting flavour compounds and solids from the coffee into the water you are about to drink – it makes sense that tweaking the water not only to provide an optimal extraction and also taste better makes a whole lot of sense. The more you read and research, it is clear a more scientific approach is being taken to many aspects of brewing, and thankfully resources exist which help the consumer at home apply at least some of them to improve the standard of our coffee. One such resource being Barista Hustle, where you can find instructions and recipes for optimising brew water at very little cost. Why would you want to do that? Well, for very little money (ultrapure or distilled water, sodium bicarbonate and epsom salts), you can test for yourself whether you notice any difference in your coffee from the water you are currently using. Let’s face it, delving further into the science around optimal coffee brewing can at times lead to the choice between either an expensive purchase or a dead-end for the home tragic who doesn’t carry an unlimited budget for such tweaks. My advice? give the recipes a try, and experience for yourself the astonishing difference in flavour and cup quality that using tailored brewing water provides. Again, think about what is occurring during coffee extraction and the proportion of water in the final beverage in your cup. Believe me, it is definitely worth it – particularly when you go back to basic filtered water after running out of the supply you prepared earlier! Maintaining my water supply is precisely why I find the Peak Water Kickstarter project so compelling, and now eagerly await the day the jug arrives on my doorstep. As I mentioned above, using a recipe and making the water yourself isn’t overly complicated – keeping enough distilled or ultrapure water on hand sometimes can be. Water can be bulky to store and buy – filter discs not so, and I’m excited at the possibility of even more easily optimising the water I use for brewing at home. At the heart of Peak Water is our innovative disc filter, combining precisely calculated flow dynamics with our new ‘filter maze’ system — ensuring that your water is completely treated, every time. The filter utilises highly specific ion-exchange resins to control and manipulate bicarbonate — the variable with the greatest impact on a coffee’s cup quality — while balancing the water’s ph level and retaining crucial minerals required for great brewing. Check out the Kickstarter page for yourself, and as with any campaign, check the FAQ’s and comments as well, however I’m pretty confident in the product given the team behind it, and their history in looking at this aspect of coffee brewing. I guess this post is part encouragement to experiment with the water you use to brew coffee with, and part suggestion to perhaps do so in the next few weeks before the Peak Water Kickstarter ends – just in case. 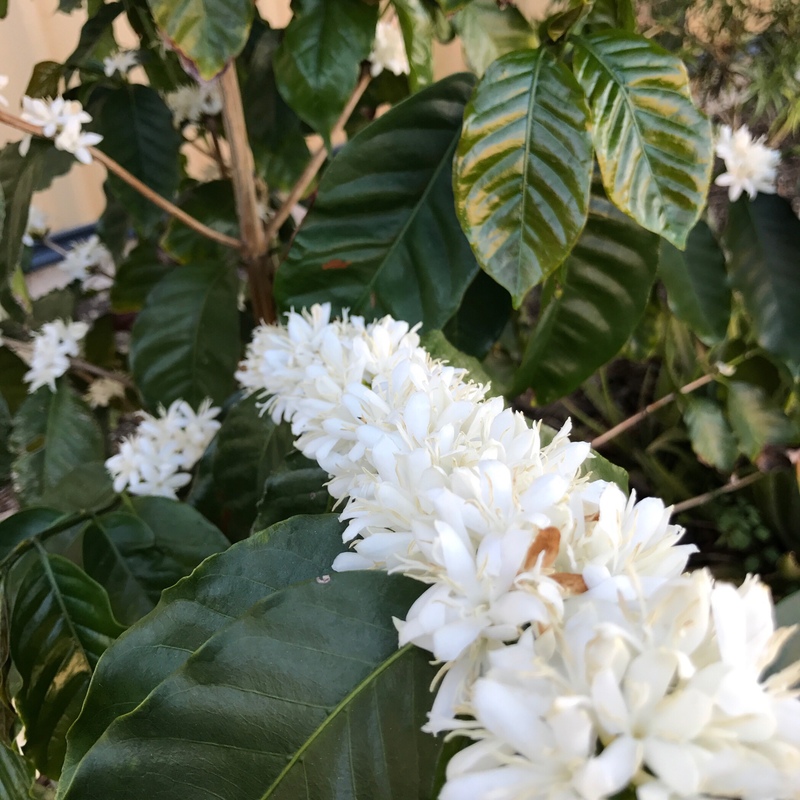 The maiden crop from my backyard coffee tree provided as many challenges as it did joys – yet I suppose I wouldn’t have had it any other way. Our most satisfying accomplishments generally make us work a little harder for them. The rewards? Well, just that little bit sweeter. In toying with prospective titles for this post, one which immediately came to mind contained the words ”a producers diary”. 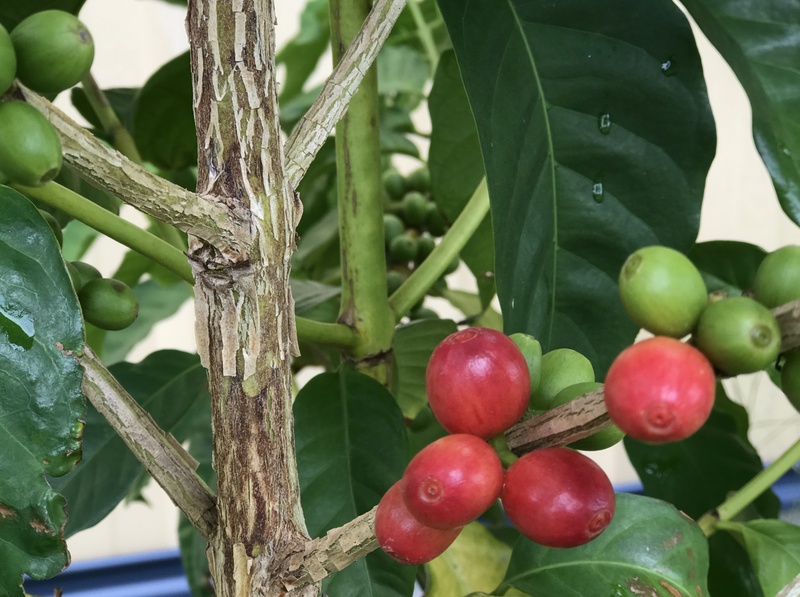 Although (perhaps) technically correct, what is involved at scale in producing coffee, and the nature in which it supports growers, their families, and even entire communities, is a far cry from my little hobby. Such a title, even though tongue in cheek, would be a little disrespectful to those who derive their livelihood from such an endeavour. Documented in a previous post was a chronicle of my initial foray into the art of coffee processing. On that occasion, it was a small lot picked from some of my parent’s trees which I processed, roasted, brewed, and thoroughly enjoyed. Never having processed coffee straight from a tree prior to that, it was certainly an experience which involved considerable learning by doing, albeit after a fair bit of prior reading. Of course, the most productive and effective means of knowledge acquisition was listening to my mother (something I’m sure she would confirm I was always very, very good at) – who has been processing her own coffee for many years now. 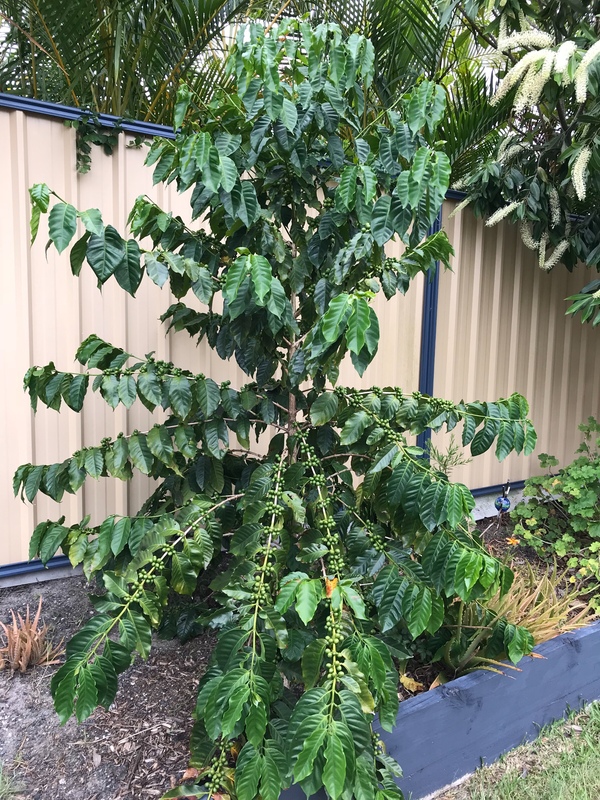 Apart from ending up with some pretty decent coffee to drink, one of the main reasons for such an undertaking back then was the coffee tree slowly growing in my own backyard. Eventually, it would also bear fruit, and with it the requirement to process the resulting crop, in the hope of ending up with something much the same in my own cup. True to the theory books – and my mother’s expectations – three years into its life the little-tree-that-could flowered and subsequently bore fruit. The next phase had finally begun, and with it, my own little vertical monopoly through the supply chain from seed to cup. Maybe not enough to retire on, but enough to at least retire to the lounge on, with a satisfying home-grown filter brew in my hand. While not a photo-a-day type record, I have intermittently documented in Day One the tree’s progression from that initial planting in March 2014, and looking back it has indeed been a journey. 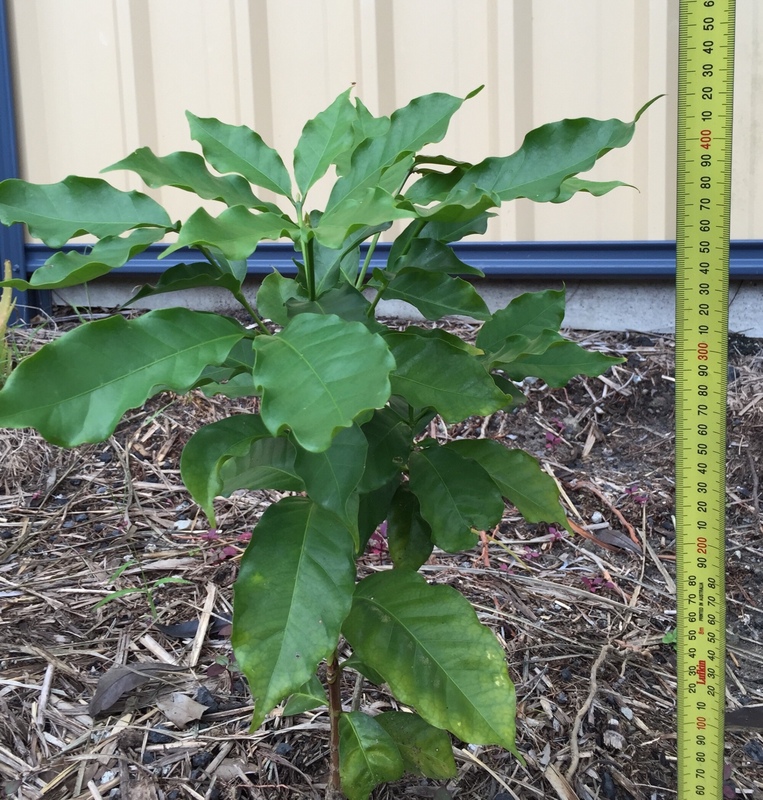 After one year the tree was a little over 40cm tall; two years along it was 95cm; three years after planting it measured about 140cm. Now approaching its fourth anniversary, the tree is heaving with a second crop, and is healthy and robust, standing just over two metres tall. This season’s micro-lot will be a little less micro, though I doubt I’ll need a team of pickers. 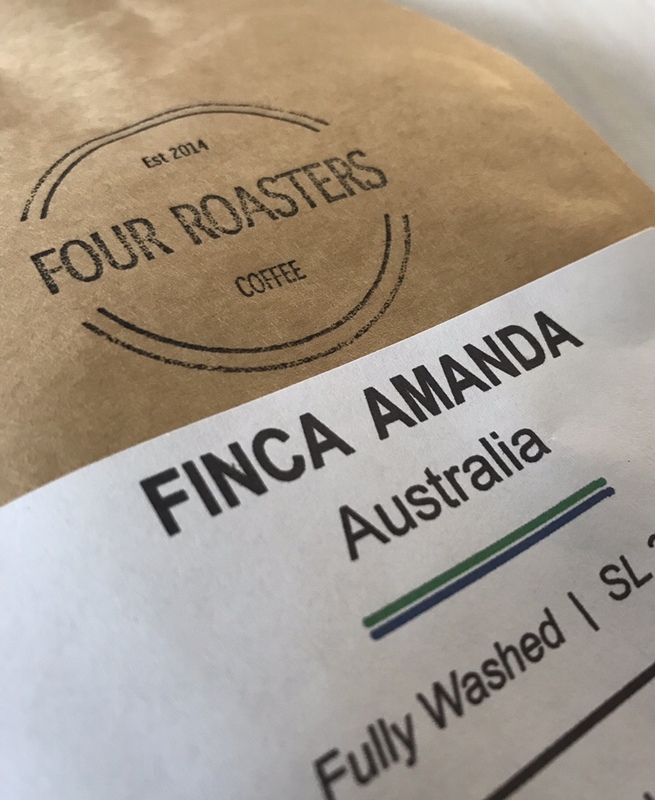 Although unable to pinpoint the exact varietal of the tree itself, it can be traced back to a small coffee farm in northern New South Wales, with a plantation of Arabica trees largely comprising the SL 34 designation. While this information no longer seems available online, we’ll proceed on that assumption, though of course it is not critical to the outcome of what follows below. Back to the initial crop, and although I didn’t expect much, could not have been happier once the tree flowered in November of 2016. Sure enough, after a brief period sporting beautiful white flowers, in the subsequent months the buds turned into green fruit, followed by further development and ripening. “They’ll be ready in about eight months,” said my mother. In the middle of 2017 (precisely eight months later), many of the cherries had turned a beautiful deep red, and in July picking began in earnest. With the cherries reaching peak ripeness at slightly different rates, picking occurred over four successive weekends into the beginning of August, and processing followed in a similar way. 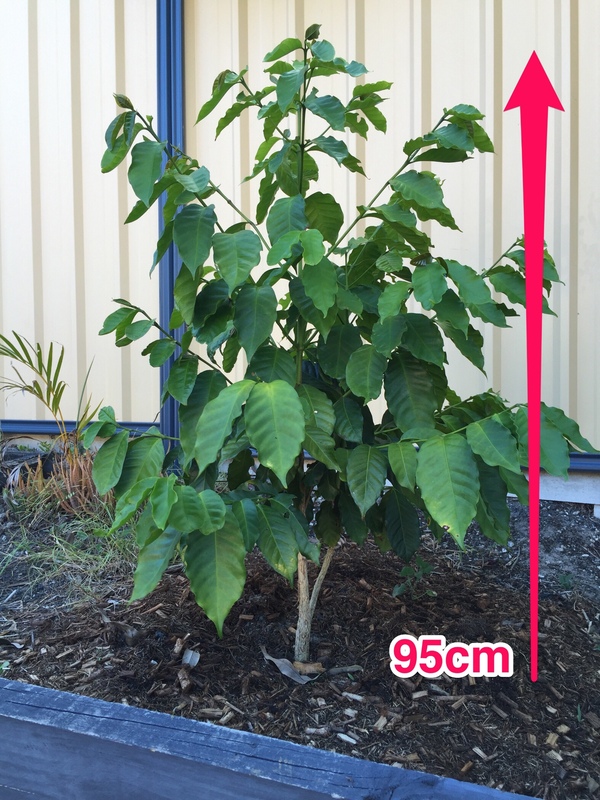 The entire useable crop in whole cherry form weighed in at approximately 700g. Interestingly, this provided just under 100g of green beans (or 14% of the cherry weight) once processing and drying had been completed. Although expected, this dramatic reduction certainly gave me pause. Thinking about the sheer volume of coffee consumed around the globe and the amount which must be grown to service this demand boggles the mind a little. At this juncture, I must admit to never having been the most attentive gardener, and the timely watering, fertilising and general care was more regularly applied by my understanding wife than by yours truly. As I find with most things, to say I could not have done it without her is as much an expression of gratitude as a statement of fact. Success! That little tree grew, flowered and produced a decent crop of fruit. Given the small (tiny!) yield I would be working with, the decision was made early on in the piece to process the crop using the washed method. Having successfully utilised this method in the past, I was fairly confident of doing so again. Washed processing also leaves less to chance (at least to this amateur) with variables such as optimal drying time and weather conditions compared to dry processing techniques. Over a number of weeks, I fastidiously worked my way through pulp removal, rinsing, and soaking/fermenting the beans in water to remove the sticky exterior mucilage before laying them out to dry. 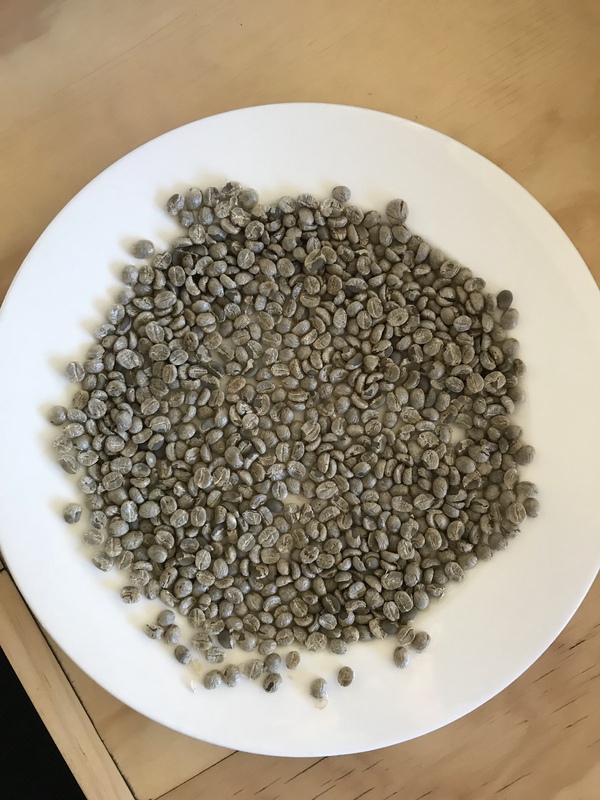 Once dry, the remaining husk or parchment was removed, followed by a couple of weeks additional drying time to reduce the moisture content, and we were then ready to roast. 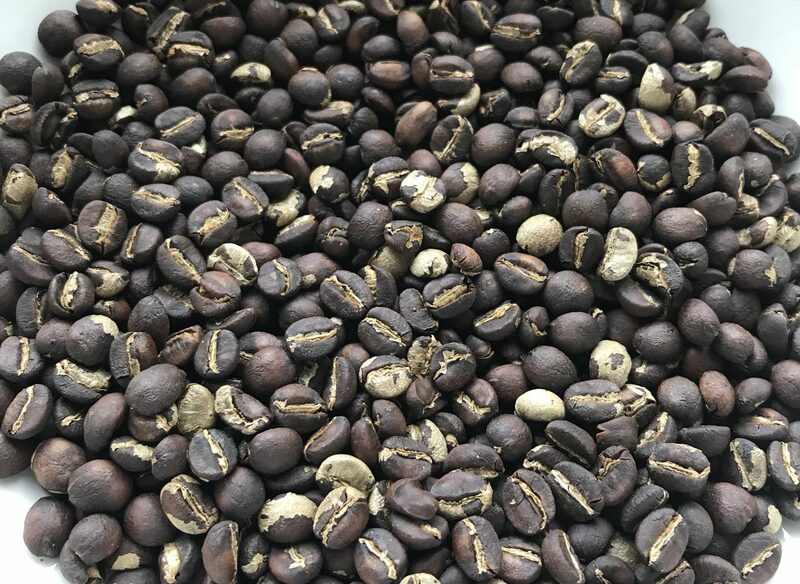 With each processing step resulting in ever diminishing returns as far as the overall crop weight was concerned, a further 10–15% was about to vanish into thin air with the usual moisture loss of roasting. Now roasting a batch of green stock weighing a drum-busting 98 grams was always going to be a delicate proposition, and to be honest I’m equal parts pleased and relieved with how things turned out. A little forward thinking about how I would be brewing, dictated the planned level of roast. If we think about it, 98 grams of green equals 80-something roasted. A grinder purge, then dialling in an espresso say, at 20g – even nailing it on the second round – and I’m through roughly 50 grams already. Once more and I’m pretty much done. Filter brewing with a V60 at my usual 16 or 22 gram dose, I am looking at four or five brews with minimal loss at the front end dialling in. So with a filter roast profile in mind, a bright spring day saw the Behmor 1600 Plus set up, warmed up, and loaded with green coffee, not five metres from where it was grown. Very satisfying to think about as I sit here and write these words. As I alluded to above, things went pretty well with the roast, yet as I come to the point of describing it for you in a little more detail, now realise I’ve thrown out my notes. Correct. For all the nerdy note taking and piles of notebooks and paper around here, I’ve called my own organisational bluff and thrown them out when tidying things up, inadvertently not scanning them first as I usually do. I do recall the roast was quite short (as you’d expect with such a starting weight), somewhere in the order of about seven and a half minutes, or maybe 7:45, with first crack at about 6:30. The overall development time ratio would be around 16% or so. I do remember thinking at the time I’d have preferred a slightly longer overall roast time and additional development subsequent to first crack, however as you can imagine, was a little paranoid about taking them too far and losing the lot. A delicate balance between enough for adequate development, without scorching the exterior of those oh-so-valuable green beans. The final yield? A no-bag-too-small 88 grams of freshly roasted goodness, ready to rest for a week or so before brewing. Finally done – the image suggests the roast was a little darker than it actually was. With a sigh of relief at having navigated perhaps one of the shortest, yet most stressful part of the journey, I was safe in the knowledge brewing would be a somewhat more relaxing process. They say the proof is in the cup, and I must admit to receiving a pleasant surprise here. Sure, I didn’t set the coffee flavour wheel spinning, however filter brewing with a V60 provided a sweet, delicate cup. Not knowing what to expect, my first sip drew an audible laugh and a wow – that’s actually not too bad. I can be well satisfied in saying I’ve managed to produce a light to medium bodied coffee, which is quite well-balanced, sweet, and carrying flavours of chocolate, with a hint of spice. For all the effort which came before it – I’d say it was just about perfect. There are only so many ways to stretch out 88 grams of roasted coffee, however what I did manage to consume over the subsequent fortnight was both enjoyable and highly rewarding nonetheless. 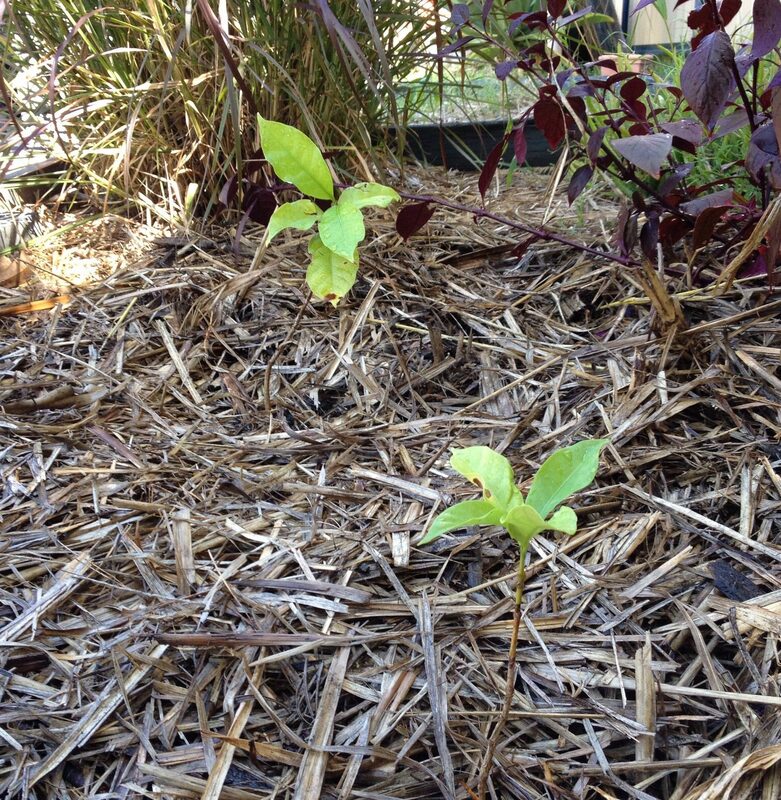 Three years ago I planted two small coffee seedlings in our garden near the back fence. Although one didn’t make it, the other flourished. At the other end of that same garden is a lemon tree, which is also bearing a nice crop of fruit. It is there any similarity ends. The lemons will grow, ripen, and once picked, be ready to use – job done. The coffee? Once ripe and picked from the tree, things are only just beginning. From that point on, there are all manner of ways to ruin it. Even if we do eventually make it through the processing, drying, roasting, storage, and brewing without robbing it of too much quality at each step – have we presented in the cup the best version of what that coffee is, or what it has the potential to be? On this occasion, I’m hopeful I did somewhat of a reasonable job, although if the answer was a flat-out yes, then the motivation to improve on the next go around perhaps drops off a little. As I look out the window now and see a thriving tree filled with green fruit, I’m determined this next crop will not only be bigger – it will be a whole lot better as well. Satisfying? Yes – just a little. Depending on who or what you follow online these days, you‘ve likely seen NaNoWriMo (National Novel Writing Month) mentioned as the month of November approached. With things having kicked off on November 1st, the progressive daily word counts are now beginning to appear in my social media feeds. To those participating this year, I wish you every success, and to those “I’m already behind” tweets – where there is a will there remains hope – a thought which worked for me a few years ago. While not diving into the full NaNo experience myself this year, I’ve decided to take a slightly different approach (though I’m not sure whether to suggest its an easier or more difficult one), and revise the 55k words I committed to pixel and paper in 2014. At the time, I wrote a couple of posts on the tools I used to get there, and a quick search of the term NaNoWriMo on this blog will pull up a few posts outlining how I managed to fall over the 50k word deadline before month’s end. Memories of how November went in 2014 fall somewhere on a continuum between I never want to do that again and I wouldn’t have had it any other way. Where my thinking lies on that continuum varies day-to-day, however one thought always remained – I never quite finished it. Sure, the actual story or first draft is finished – it has just never been revised and edited. You know… finished. Have I not had the time over the intervening three years to read, revise and improve on that initial effort? Absolutely. Just couldn’t do it. I even started a couple of times only to be thwarted by some innate inability to read my own work, let alone embrace the apparent enormity of the task. So why now? A very good question, though perhaps not as good as the one which asks: what makes you think you can do it this time?. To be honest I’m not entirely sure I can, however in my own mind am a little more definitive about giving it a go this time. After all – I have a plan! Three years on, the statute of limitation seems to have expired on those feelings of oh wow… I can’t read this, so away we go I guess. Besides, is it not the least I can do after having put my mother through proof reading and editorial duties the first time around? Diving into a river of bad grammar, poor punctuation, and let’s face it – a somewhat dubious plot line and story structure requires some sort of plan. I have 55,000 words over 32 chapters, so the common sense approach would seem to be about one chapter per day. With reference to my Tools below, I plan to make a first pass through each chapter making corrections and notations by hand, subsequently transferring those to digital form. Being relatively confident I will get through the initial markup, my fear is becoming bogged down in rewriting and larger changes. Should this be the case I think I’ll leave any major section rewrites to a later time if things head too far in that direction (says he who sets himself up for failure: hmmm…yes, that’s too time consuming – I’ll just do that bit later…). With reference to those previous posts about the tools used in creating the first draft, I might simply argue if it ain’t broke don’t fix it, however that would be oversimplifying things a little. The fact is I tend to proof and revise things far more efficiently and effectively in a very different format to what they were written in, and am of course far from alone in this way of thinking. At the very least this takes the form of a text editor’s preview pane or say, Marked 2, in an entirely different theme to the editor pane itself. Better yet, with the physically printed word I am able to hold and manually scratch, scrawl, and mark up or annotate by hand. I don’t believe I am necessarily in the minority with this type of approach either, however perhaps a generation of digital only writers, editors and reviewers are now on the scene, and I would be considered a “throwback”. If not the case already, that time certainly cannot be far away. In any event, given my reticence to get stuck into this task in the past, I’d suggest I am in need of selecting not only the best tools for the job, but those most likely to maximise my chances of success. For all of the notebook and paper reviews I’ve done extolling the virtues of my favourite types, the manuscript is printed out on standard office copy paper. Yes I know – I thank you for your kind thoughts and commiseration, however do believe I’ll cope. Strangely enough, my previously abandoned attempt at this task found the paper – while nothing to write home about – certainly usable. I cannot recall the pen I was using, however the J. Herbin Orange Indien ink feathered just a little, and demonstrates some show through, however I’m simply taking anything I can see through the page as a sign of progress. I’m here to mark up, and can see it’s mark up I’ve done – a positive approach I’ll run with as far as it takes me. The pen? Well it really could have been any of a number of choices, though in the end the FM nib squeezes my corrections and notes in and around those tighter spaces, as well as minimising feathering given its relatively restrained ink flow. The maroon with silver trim simply seemed like a good fit for the ink colour – or perhaps I thought it would set a creative mood? If I’m to make a permanent record of any of these planned improvements, a digital element to this process is rather important. The choice here was easy, despite the significance of throwing 55 thousand words in a text editor, needing robust iOS syncing (I’m using Dropbox), and trusting my hard work will be safe, saved and ready to go anywhere over the next 30 days. You may be thinking I’ve said the choice was easy given my loyalty to Ulysses for writing over the past three years, however given the title of this section, clearly that isn’t what I mean. I began using Ulysses through the promo trial for NaNoWriMo back in 2014. Fitting then that I’ll be testing something different this time. My reference to the choice being easy, simply relates to a recommendation from a very good online friend who has helped immeasurably in much of my Mac related development over the past couple of years. I still maintain the best thing to come out of this blogging caper are the people you become acquainted with as a result. So, when someone whose opinion you highly respect makes an app recommendation, I feel it is well worth trying out. Armed with the Pro version of MultiMarkdown Composer v4, I am ready to work through and make any necessary adjustments or rewrites. As you can see, I have dropped the text into a Markdown file, and MMC4’s Table of Contents provides me with a nice sidebar view of my chapters. Although arguably possessing a few less bells and whistles than Ulysses, MMC4 provides everything I need for the task at hand. It’s a robust and powerful text editor, and if that isn’t what I need for the task at hand then I’m clearly approaching this all wrong. I’m also interested so see how the iOS Files app handles Dropbox syncing when I use Byword on my iPad to squeeze in a few updates at lunch time. A few days in I can report so far so good. It would however be remiss of me not to mention encountering more than a couple of Byword crashes when using Copied in split view on my iPad (Air 2 running iOS 11.1) putting this post together. Enough talking, as the time to commence reading, critiquing and rewriting has already passed. I’ve indeed made a start, however am yet to convince myself that my will is strong enough to push on and get this done in a month. I’d like to at least think I can make one complete pass through with pen in hand – even if the rewriting comes a little later. To all of those creative and motivated souls who’ve dived headlong towards the 50k word target, I wish you well. While its fair to say I have a certain reticence towards fully editing my first draft, I’m certainly glad I managed to create it. Anyway – it can’t be that bad. My mother wouldn’t lie would she…? The title of this post may just as well have been A Surprising and Very Generous Gift, given the pen recently turned up out of the blue in my letter box. These types of things will occasionally happen when good friends stop by the Lamy store in the company’s home town of Heidelberg, Germany, though it certainly doesn’t make me any less grateful a recipient. Written correspondence between myself and said good friend, is often filled with pen related matters — some of which in recent times has centred around this particular pen when he spotted it at a Lamy exhibition in Frankfurt late last year. It was then titled the JM1 (for reasons now apparent), and slated for release in 2017. So, on the receiving end of a very kind and generous “this is that pen we were talking about, see what you think” — what follows is, well… what I think. I’ll be honest with you. Upon arriving home from work and picking up the pen my first thoughts were: wow, its bigger and heavier than I expected; gee I hope I can use this; and I think there will be many who won’t like it. To be entirely honest I wasn’t overly keen on it myself. In the few days and weeks that followed, much to my absolute surprise, this opinion completely turned around. Ultimately I cannot speak for how it may or may not suit other pen people’s tastes or writing styles, though it quickly aligned with mine. So right from the outset, I’ll make it clear I’ve many positive things to say about this pen, however didn’t know I’d love it until I used it… a lot. Had you asked me the same question on the first day or two, it would have been a very different story, which perhaps doesn’t bode well for a quick in-store test if someone were considering a purchase. Those initial first impressions were influenced somewhat by the product shots I’d seen, which to me, were of a pen somewhere in the Lamy 2000 size range (comparisons to which are inevitable, and for frame of reference I’ll run with that at times in this post). In reality, its bigger, and a lot heavier. I’d also go so far as to say it feels even bigger and heavier than what it actually is when compared to the 2000. First thought: this will be too heavy for any long form writing. Reality after more use: the balance makes it perfect for longer writing sessions and I’ve found it as comfortable as many of my other favourites. First thought: this design doesn’t seem to be a huge departure from the overall theme you see in some of Lamy’s other pens. Reality after a little reading: oh… I get it. That’s absolutely spot on then. A little more on that. Sidenote: I am not much of a designer so take the following within that context — though I guess I am a consumer with an opinion. Probably a relevant question here is whether I should be required to research the manufacturer’s PR release or product sheet about a pen to know whether I like it or not? The answer of course is no, though in doing a little reading I did find I developed a better understanding of what appears to be scope and philosophy of the design behind the Lamy aion. Whether it is a decent pen or not is another, more straightforward question entirely, which I’ll deal with in other parts of the post. I say straightforward simply because that is largely a matter of personal opinion and preference, and I’m happy to outline my thoughts on that. Lamy seems to cop its fair share of criticism for releases which may be seen as less than innovative or not different enough for some tastes, and though I could be wrong, think it is inevitable the aion may be seen in the same light. Again, whether the design and functionality of the pen suit your particular preference is entirely for you to determine, however as for the merits of the design or Lamy’s decisions in general, perhaps a little background and context is helpful. Disagreeing with the design of something does not make the design wrong, nor prove the company got it wrong, and perhaps most importantly — does not make you wrong. It simply means it’s not suited to your style, taste, or how you may use the particular product from a functional perspective. Designed by the British industrial designer, Jasper Morrison, this is absolutely in harmony with his conviction that good design is maximally simple – yet, at the same time, maximally functional. There are many more quotes I could pull from the three pages of information on the pen, and of course any of the above can be debated on their own merit (particularly how maximally functional the pen may or may not be). I do think however, Lamy has — and probably always have — clearly shown their views on what these types of statements represent to them, and largely banked what appears to be a very successful company on them. If that is the aim, kudos to Lamy. Kudos to Jasper Morrison, who appears to have nailed the brief. There will invariably be different views on what is modern, minimalist and functional — as there should be. There will be those who prefer pens with perhaps a bit more flair, colour and variety, and not derived from a familiar theme — as there should be. Notwithstanding the above, I think Lamy has successfully achieved what they set out to create. No pen is for everyone, and individuality both in opinion and purchasing makes this hobby what it is after all. Back to matters at hand. The aion comes in two colours: black and olivesilver (yes — one word). Though I expect an eyebrow or two to be raised over the naming here — to be honest, does it really matter? I say no — particularly if you’ve checked the names of car colours, house paint or even fountain pen ink offerings lately (none of which I have any issues with either mind you). As you can see from the images, the model I have is black, which as you would expect is darker than the 2000’s makrolon. The matte and anodised finish, while not as dark as your high gloss resin pens, as you’d expect doesn’t reflect the light like those either. The only contrast to the barrel are the silver nib and spring-loaded Lamy clip. As far as the shape is concerned, there is no real taper to speak of in the cap, a minor one nearing the top of the pen, and a slightly more pronounced one as the grip approaches the nib. 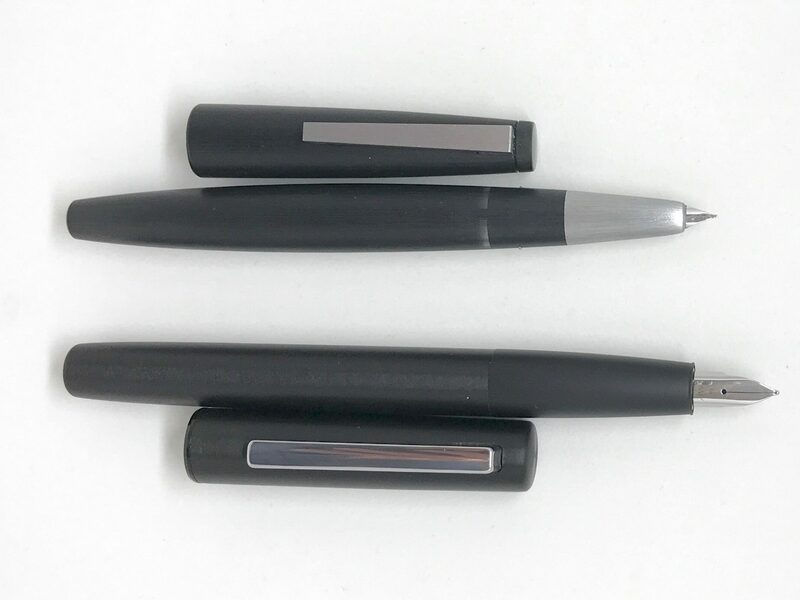 As you can see from the comparison table and image, at its widest point, the Lamy 2000 carries similar girth to the aion, however once the 2000’s taper begins (towards either end), any similarity quickly ends. I’d tend to agree with the sleek, modern, minimalist group of descriptions you’d find on the Lamy product page. Yes, the aion is created in the spirit of the 2000, however the brushed aluminium and matte finished aion is a very different pen in its own right. …the aluminium housing elements are formed by deep-drawing. The surface structuring is computer-controlled by robot-supported grinding. For its unique finish, the components of the LAMY aion are first brushed, stained, polished and, in the case of the grip, blasted and then finally anodised. For a firsthand look at the manufacturing process, I refer you to the aion product page which contains a video demonstrating these steps in the pen’s construction. Precision and quality control are words which come to mind when viewing. There is slight change in both the appearance and texture between the grip and the rest of the barrel. To me, the anodised grip feels a little smoother than the matte-finished barrel, though I have not found any issues with grip or control when writing. At the junction of the two (which unscrews to allow access to the cartridge or converter), the small seam can be felt by a finger running back and forth across it, however is imperceptible during use. Given the change in texture, having a seam probably makes no material difference, so to sound somewhat ridiculous, the seam is probably as seamless as you could find, with the exception of those on the 2000 which are effectively invisible when closed. 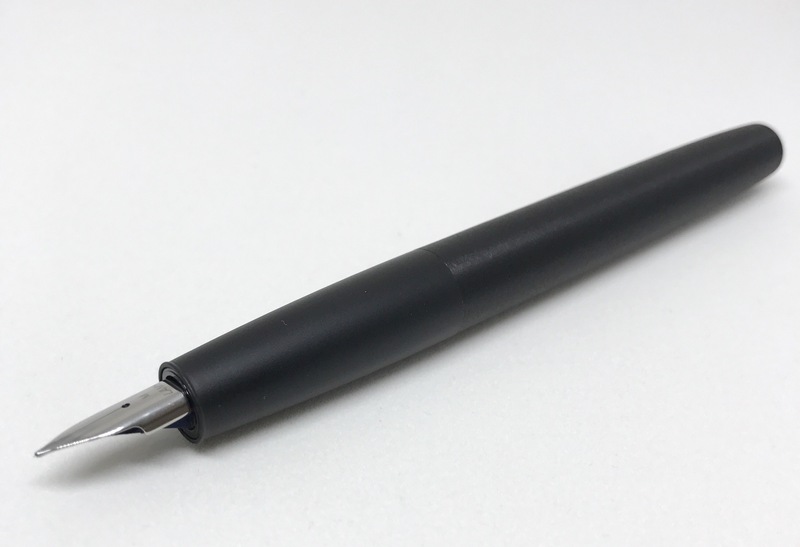 The cap can be posted (as Lamy’s product images show), however to do so feels impossibly heavy to write with, and thankfully more than enough length exists in the pen to use it without posting the cap. While we’re on the cap, the snap closure is a very solid one, requiring some force to disengage, almost preventing a thumb and forefinger one-handed snap-off which I tend to do on occasion. A couple of other points to note here. When snapped on, the cap itself spins freely, and if I shake the pen there is a small rattle between the cap and the body. As I’ve mentioned, there is certainly no danger of it coming loose, however there is some play there. Whether this is the case as standard or simply on this particular pen I’m not 100% sure, however seem to recall something similar mentioned on Reddit. Occasionally when recapping the pen, I need to slightly readjust my direction before the cap snaps home. 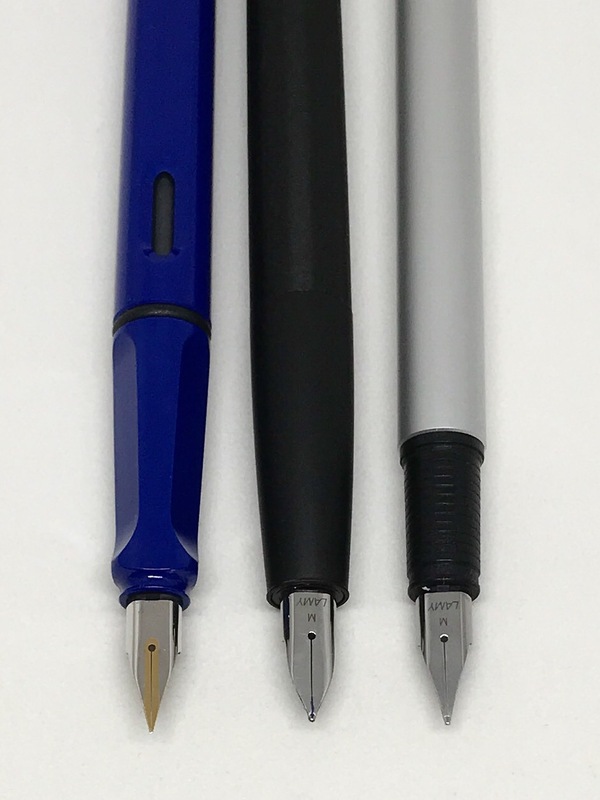 Though I point these things out, I have no great issues with them in day-to-day use, where pen performance and writing comfort are more important to me anyway. The aion series of fountain pens are fitted with a steel mono colour nib in silver, which although very similar, is a departure from the usual form, as you can see from the comparison image below. Although I perhaps wouldn’t go that far in my description (don’t think I’ve ever referred to anything as avant-garde), it is certainly something new for Lamy, and I actually quite like the nib shape (more on writing performance later in the post). While I don’t necessary think one of the original Lamy nibs would look out of place on the aion, to my eye the broader “shoulders” of the tines certainly suit the fuller overall profile of the pen. 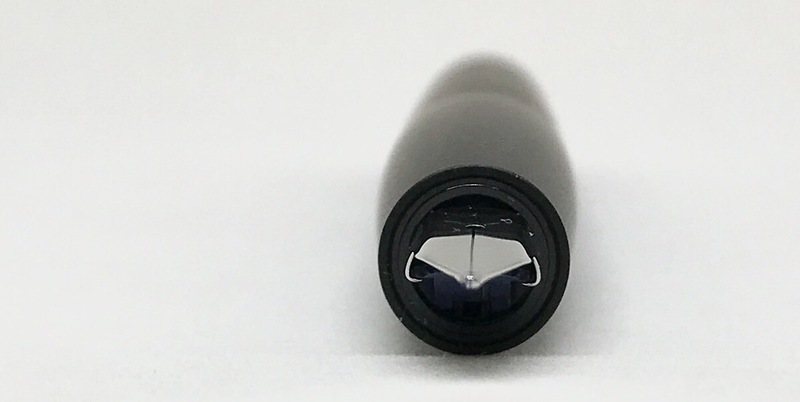 The remainder of the nib as it fits into the housing appears to be identical to the Lamy nib units we are all familiar with, and from what I have read (again via Reddit), a Lamy rep somewhere has confirmed it can be swapped with other Lamy nibs in the usual way. In any event, when talking nib shape, a picture certainly will provide you with far more than my words, so I’ll end this here. In doing so though, again even if not something extraordinarily new — kudos to Lamy for providing something different, which I’d say successfully ties in with the overall design of the pen. Though the key points in relation to the specifications remain the size and overall weight, in isolation these are only chapters of the story. A story which is only complete when balance and function put them together. That said, this certainly isn’t a pen you’d carry in a shirt pocket all day. If you click-through to the Goblet Pens page, you will see the aion carries a list price of US$71.20 with a MRSP of US$89.00. Although a conversion to Australian dollars at the time of writing is just over the AU$100 mark, I would be loathe to make any strong prediction as to the actual cost here (which would also be a little unfair to local retailers), given various other factors which may be involved in setting local prices. At the time of writing, my favourite local retailer in Brisbane’s CBD had not any word through on price or release date. Or in other words, the money ball. Design scope and brief, construction, finish and marketing aside. Its a pen. It needs to write, and write well or we’ve really got nothing much have we. The aion certainly does that — and does it in spades. This is a fantastic nib. A stock standard steel nib (albeit in a newer shape), and it writes like a dream if given the best opportunity. I have a blue Lamy cartridge providing the ink, and as far as I can recall, there have been no false starts, skips, or holidays in any strokes over that time. It produces a wet, full, vibrant line and continues to do so for as long as you need it to. The overall feel of the nib is firm, and takes some pressure to increase the line widths, however I do not find that aspect much different to the other Lamy steel nibs I use from time to time. I’d also mention here, that the only time I’ve found the sweet spot more difficult to find is when I’ve used a slightly heavier hand with the pen. The real joy in using the aion comes from a fairly high, light grip, and having the weight and balance work for you. Don’t choke down and micromanage those letters and I think you’ll likely find the same. It needs a loose rather than tight rein, and is the “opportunity” I mentioned above. In a pen body sans threads, bands or steps, you really have the option of any grip point you like, and its worth adjusting things a little to see what placement suits the balance of the pen. Of course we all have our own styles of writing, and if the above doesn’t sound like something amenable to yours, I wouldn’t say this pen is not for you, however I’d give it a thorough test prior to purchasing if that is at all possible. I acknowledge though, in many cases it often is not. I received this pen in the mail on the 1st of August, and as I finalise this post, it has had what is now approaching four weeks of solid use. I mention this simply because that is generally a far shorter time period than for other pens I write about here. 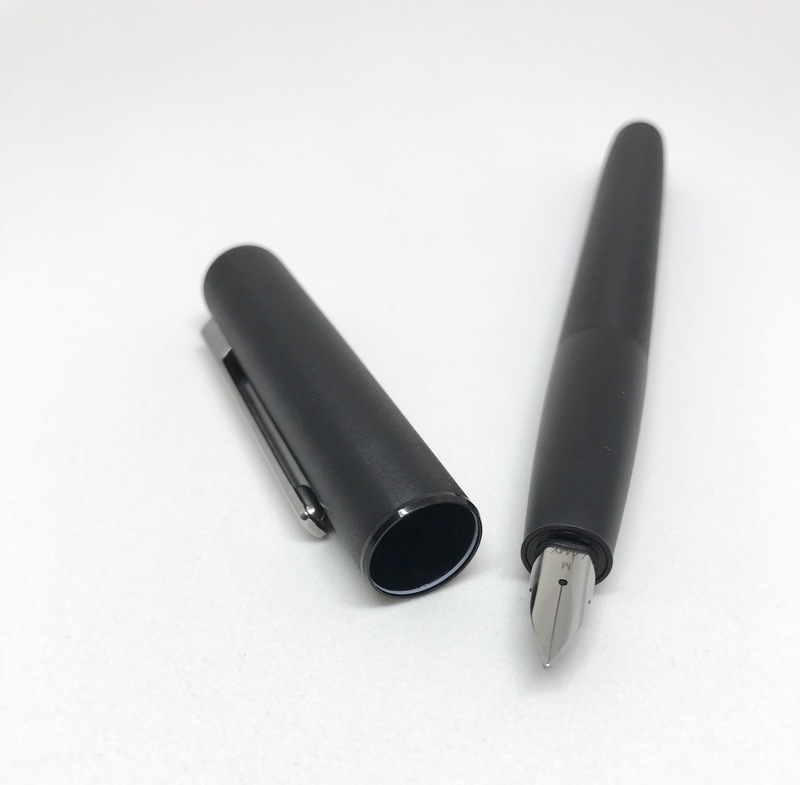 Having been lucky enough to have had the opportunity to use the pen prior to its wider release, I’m hoping this post may be of some assistance to readers who may consider purchasing the pen once it does hit the shelves. As I’ve mentioned in other posts, most of my pens are either shorter idea-jotters/notetakers, or longer form writers, as I find some pens just aren’t comfortable over longer periods of use. On the day of receipt and for a couple after, I must admit the aion was almost chained immediately to the notetaker pole. There was no way this hefty thing would leave my hand ache-free over a multiple page letter or blog post draft. Once those initial few days had passed however, it was moved firmly into the long form writer camp, and after a couple of weeks, resides with those pens I’d likely use more often than some of the others. A pen like this one will always default to a notetaker until proven otherwise, which, in continuing to surprise me to this day, is exactly what happened. I’ve found the overall balance (unposted) to essentially negate the weight of the pen, making it effortless to use over multiple pages. Not only that, it encourages me to use a lighter grip and more fluid writing motion — something which I often struggle a little to maintain. Of course your personal writing style is likely to be vastly different to mine, so consider this simply one viewpoint on the matter. Is it that good? Well in my view, for the price point it certainly is a great pen with a great nib. Will it be great for you? That I cannot be certain of, and the thing I wish to emphasise here is the key to all of this I guess: for me, the aion is that good because it’s simply that suitable for how I use it to write. Remember, you are reading the blog of someone who isn’t as fond of the Lamy Safari as many readers probably are. Great pens no doubt — just not a great fit for me. Each to their own, and I think in the coming months we will find strong opinions both ways as the Lamy aion gets into more hands. Whether I’m reading or writing them, I’ve always approached pen posts as tales of subjectivity, with really only a table of specs to the contrary. After all, the look and feel? My opinion. The weight, balance and what the pen is good for? My opinion — on how it suits me and what I tend to use it for. An underperforming nib is perhaps an exception, but its general characteristics? Just as much what I personally prefer as anything. And so it continues here. As you can tell from probably too many words above, I like this pen — a lot. Initially? I didn’t like it very much at all. As surprised as I was (and still am), the aion has certainly made an impression by completely flipping my initial views on their head, and I cannot help but think that means something. Perhaps that is the epitome of great design. Perhaps it is something less profound (ideal weight, a great nib and solid performance). Whatever it is, I’ll take more of it, and although many will say: “this pen is not for me” — I won’t be one of them, and what a positive outcome that is. My thoughts about Lamy’s design intentions are certainly just that — my thoughts, however regardless of how you view this pen, I’d argue Lamy have achieved what they set out to create. In the end, whether that achievement is enough to add the aion to your collection, only you can answer. In any event, it won’t be long before the question is asked.